The retail sector in Santa Barbara, particularly downtown, has been struggling. 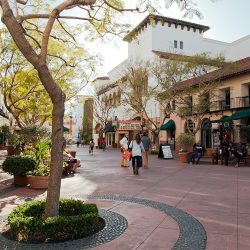 Santa Barbara retailers currently face a perfect storm due to recent local natural disasters that have added to the impact of e-commerce, national trends, neighborhood vacancies, Byzantine local regulations, and the high cost of doing business in the city. On March 21, the World Business Academy’s Global Citizens Club convened a panel of local thought leaders and retail representatives to discuss the current state of State Street and how to champion more innovative solutions to improve the local economy. Moderated by Academy founder Rinaldo Brutoco, the Academy is working to bring people together to make downtown Santa Barbara a more desirable destination for residents and tourists, to boost pedestrian traffic, and improve our local economy by revitalizing the local retail sector. The meeting included guests such as Santa Barbara Mayor Cathy Murillo, City Council members Kristen Sneddon, Eric Friedman and Jason Dominguez, and representatives from Assemblywoman Monique Limon’s and Supervisor Joan Hartmann’s offices. Now in its 30th year, the World Business Academy is a Santa Barbara-based think tank and action incubator for positive solutions to the critical environmental and social crises that directly impact our community. The Academy advocates for sustainable energy use and other timely environmental issues by working to elevate the consciousness of people in the business community and encouraging them to use their influence to take responsibility for the environment. The Academy works to embody “think globally, act locally,” as it delves into related issues important to the community. Santa Barbara’s economic health, housing needs, and retail sustainability are among the issues the Academy seeks to address over time. A key goal of the meeting was to start a discussion about how to create a coherent and actionable downtown plan for Santa Barbara. Currently, no one is spearheading this issue. There is no plan of action to help State Street regain its lost luster and lost sense of community. The area faces high vacancy rates and the perception that it’s not safe, dirty, and unwelcoming. State Street has an unappealing mix of retail tenants to the local community. The large Macy’s building at Paseo Nuevo, located on city-owned land, is vacant with ideas floating around for more department store retail to fill the space – an idea we should question considering the decline of department stores and their success in the county and across the nation. The downtown area also lacks housing or live/work spaces for local people who could walk to State Street businesses. State Street needs to be revitalized to meet of not just the tourists, but the needs of the local community as well. “It’s appealing to teenagers or tourists, not so much locals,” said Kate Schwab, Marketing and Communications Director for the Downtown Santa Barbara organization, citing findings from a study her organization commissioned on the Downtown area. Schwab was among the panelists participating in the discussion, and said it’s time to work on bringing new, engaging businesses to downtown. Another panelist, Angel Martinez, the former CEO of Deckers Outdoor Corporation, noted that other communities and business are experiencing these same issues with their changing retail neighborhoods and unappealing malls that now all seem to look the same. “We are now finding ourselves in the world of retail in a revolutionary moment… Think of the Internet today as a railroad, a new railroad. It has done one really critical thing, it has upended the distribution model.” Martinez said local stores are no longer the main purveyors of goods; people no longer need the general store because they have Amazon.com, he said. Ken Oplinger, President/CEO of the Chamber of Commerce of the Santa Barbara Region, mentioned the widespread perception that State Street is dirty, has high rents, and is unsafe for visitors. He said that commercial real estate people must work with the city to bring the right kinds of tenants to the vacant properties. Amy Cooper, the owner of Plum Goods – a gift, home, clothing and jewelry store featuring ethically made merchandise and an art gallery – said shopping should be an inspiring, spontaneous, authentic, and creative experience that makes people happy and stirs the imagination. “You can find things online that you are looking for but you can’t find what you’re not looking for,” said Cooper, who also advocated for having a point person to coordinate revitalization efforts Downtown. Santa Barbara lacks housing, especially in the downtown area, where local people work, live, shop, and eat. Ideally, housing areas would be in locations where residents could walk, bike or take a bus to work. The City Council can and should immediately appoint a commission that would begin developing housing plans and units, in addition to addressing specific local issues like granny flats. The plan should seek to provide affordable housing downtown for local residents vs. favoring developments that become high-end vacation homes. As a major landowner, the City should use its power to create a desirable mix of retail and residential units in the downtown corridor. This requires thinking outside the box with incentives for affordable rentals, creative living cooperatives, and developing other ideas to increase housing density downtown and across Santa Barbara. Why should the vacant Macy’s building simply become another store? Does our downtown need another large store? What about tearing down the building and erecting housing lofts with commercial space on the ground floor and apartments, lofts, or condos on the upper floors? Among the other factors identified as inhibitors to improving downtown and attracting new, exciting businesses are the inexplicably long permitting process, the high initial costs for starting a business, and the challenge of filling large retail spaces that aren’t as suited for newer, smaller, and locally owned business entrepreneurs. In conclusion, the saying goes that it takes a village to raise a child. The World Business Academy believes it also takes an entire village’s effort to re-invent itself, and that everyone in the community can and should take part in it. Want to watch a recording of the meeting? Check it out here.